With it’s curvaceous Jumbow shaft this version of the Grays GX7000 hockey stick is designed for the rounded attacking midfielder. Right from the top of the handle the Grays GX7000 Jumbow curves beautifully right down the shaft of the hockey stick. 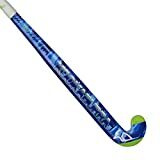 This elongated bow brings the stick right over the top of the ball, aiding elite dribbling skills. This long extreme bow might take some getting used to but the shape is perfect for performing slap hit passes because with your hands low and the stick at an angle the Grays GX7000 Jumbow seems to wrap around the ball. Keeping it low and very accurate one you are used to it. Why this Jumbow GX7000 is so well rounded is down the shaft of the stick further. The 24.75mm curve takes a distinct additional bend at 200mm up from the ground. Adding to the existing curve in the upper part of the stick this little extra bend allows for the drag-flicking and passing power needed by a secondary penalty corner taker. Built with a high level of carbon (80%) and finished with aramid and fibreglass the Grays GX7000 Jumbow is chosen by midfielders who need to be multi-functional on the pitch. This combination of materials with the addition of Grays IFA “Improved Feel Area” gives the hockey stick a nice lighter touch on the ball. Allowing you to receive, dribble then feed the ball to a teammate. If you are looking to make a development in your game to become more like an elite player then the Grays GX7000 Jumbow might just help you on your journey. The layup on this hockey stick is up there with some of the best hockey sticks in the world. You can pick up one of these Grays GX7000 Jumbow sticks for less than half what it might cost you to take a top of the range stick with similar profile from other brands. We love a bargain and that is why this stick, if you are looking to move your game on to accommodate a more extreme bow from your hockey stick, makes the Grays GX7000 Jumbow a fantastic option. Not just for the player progressing, the GX 7000 is already used by some of the best players in the world. Iain Lewers and Adam Dixon from the England team are just two international players I have noticed using this stick. Though this stick has a relatively light feel for a high-end hockey stick, the Grays GX7000 creates some serious power on the ball. The Jumbow GX7000 is the only stick in the range available in a Super Light weight option, which will suit quick reactive dribblers. I noticed slap hits come out like a rocket and a straight bat smack at the goal was much much harder than I expected, considering how lightly it receives the ball at pace. However most of the power is in push passing where I felt I could shove the ball from one goal to the other without any back swing. The Grays Jumbow version of the GX 7000 is also fantastic at hitting the ball on the reverse side. This Jumbow shape actually seems perfect for it. The long curve with the extra kink at the end combined with a slightly more open blade profile connects fantastically to the ball on the reverse. Contrary to the standard side I actually found that hitting the ball on the reverse, as apposed to pushing it is better with the GX 7000 Jumbow. This is a particularly week area of my game and I can see this stick improving it significantly. Overall the GX7000 Jumbow is a great stick. Elite layup and technology for a mid-range price this stick goes up as one of the best options for the advancing player. If you are knocking on the door of the 1st team, get yourself a Grays GX7000 and master some advanced techniques.